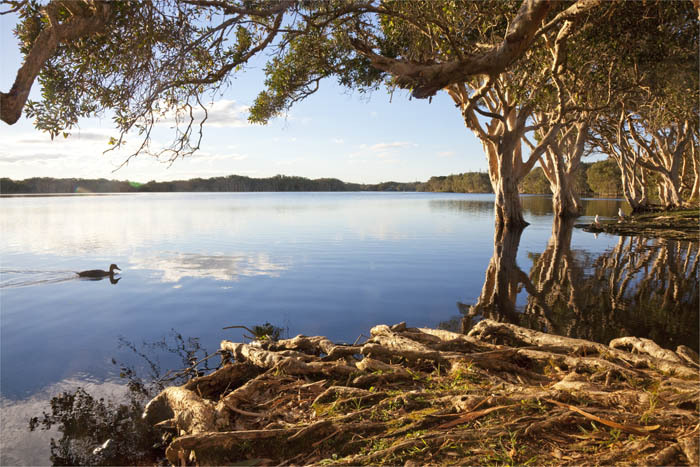 A calm winter’s evening at Lake Ainsworth, Lennox Head. Regular readers will have noticed the new header image added earlier this week. A Sunday afternoon family visit to Lennox Head paid photographic dividends. We watched from Pat Morton Lookout as the Humpbacks migrated north before we in turn migrated into Lennox for a walk and were treated to the spectacle of the winter sun slowly setting behind the beautiful Lake Ainsworth. This freshwater lake, situated just behind Lennox’s Seven Mile Beach, is surprisingly deep and stained the colour of black coffee by the tannins of the surrounding tea trees. In summer, the lake is a safe recreational playground, with families swimming, sailing and kayaking in the cool, dark water. This particular evening it was all but deserted, the calmness of the water only disturbed by the passing ducks. The still, black surface of the lake provided a deep, mysterious mirror for the yellow trunks of the paper-barks. It’s moments like this that make you glad you’ve brought your camera with you.